Spode & Copeland Marks and Other Relevant Intelligence, Second Edition, Studio Vista, London, 1997, p. 90. This mark is recorded as used for Forest Landscape II. 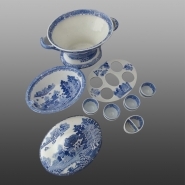 View of the tray showing egg cups and salt and pepper container. View showing all of the components. A pearlware center supper dish printed in blue in the Forest Landscape II pattern. 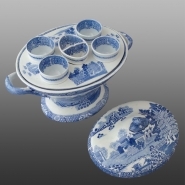 It consists of an oval footed tureen and cover with an internal tray holding four frame egg cups and a small oval divided salt and pepper container, along with an alternative oval liner with lifting lugs for use instead of the egg cups and tray, printed throughout with the Chinoiserie scene and border. Unmarked, but two egg cups have a workman's painted mark on the base that matches Spode's mark WMP19, a "V", referenced in Copeland, Robert. Spode & Copeland Marks and Other Relevant Intelligence, Second Edition, Studio Vista, London, 1997, p. 90. This mark is recorded as used for Forest Landscape II.